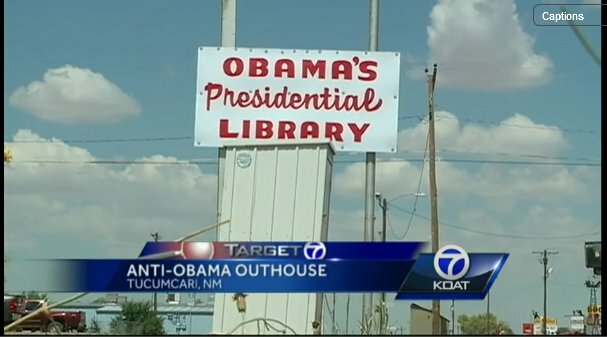 An outhouse sign that says “Obama’s Presidential Library” has Liberal media in a tizzy. It’s amazing how the media claims they had such a hard time finding someone who liked the “politically charged” controversial sign. I’m sure the difficulty was more prevalent amongst the camera footage editors. Note at the 1:40 minute marker how the reporter calls the city manager to make sure she stirs the hornet’s nest of manufactured “controversy“. The city manager had not seen the sign nor aware of it (before she called). TUCUMCARI, N.M. — Just a stone’s-throw away from historic Route 66 in Tucumcari sits a sign that everyone’s talking about. Some in town say it’s in bad taste, while others support it. 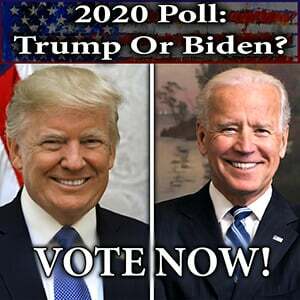 Either way, everyone knows about it. One man said people have been treating it like a tourist destination, taking pictures all the time. As for the man who put it up, he refused to give Target 7 his name or reveal what prompted him to construct the controversial commode, but he said he has no intention of taking it down. Target 7 contacted city manager Doug Powers to see if the city was doing anything about the sign. He said he hasn’t seen it yet, but will go to the site soon to see if it’s breaking any city codes. However, when it comes to the message, Powers thinks the city doesn’t have control over what people say. Tucumcari is a popular overnight destination for people traveling the US on Interstate 40. Target 7 asked Powers if he’s concerned the sign may give those visitors a bad idea, but he said because he hasn’t seen it, he can’t comment. The sign and outhouse have been up for a few weeks, if not months, according to its owner. “That’s my opinion … and fortunately, that’s one thing they haven’t taken away from us … is our right to our opinion,” said the man who constructed the sign.